A leading mechanical engineering specialist is celebrating a record-breaking year after securing a landmark contract with Boeing. MetLase, which is a joint venture between Rolls-Royce and Unipart, has been announced as the tooling and fixture partner for the world’s largest aerospace manufacturer’s new Sheffield facility in a deal that will initially increase the workforce by 15%. The company will use its 3D design capabilities, high precision laser-cutting technology and patented assembly and joining systems to create lightweight and optimised machining fixtures that will precisely hold 11 different castings used in the production of actuation system components for the 737, 767 and 777 passenger jets. MetLase specialise in the manufacture of world class tooling, intelligent fixturing and components, bringing lead times of months down to hours or days. This contract with Boeing is the latest in a line of new business wins that include strategic partnerships with blue chip companies in sectors such as automotive, aerospace and energy – marking a 70% annual increase in sales for the Sheffield based firm. He went on to add: “This contract is an ideal way to celebrate our third birthday and is also excellent news for the region, with two other local companies – Maher Ltd and Nikken – also being awarded contracts. 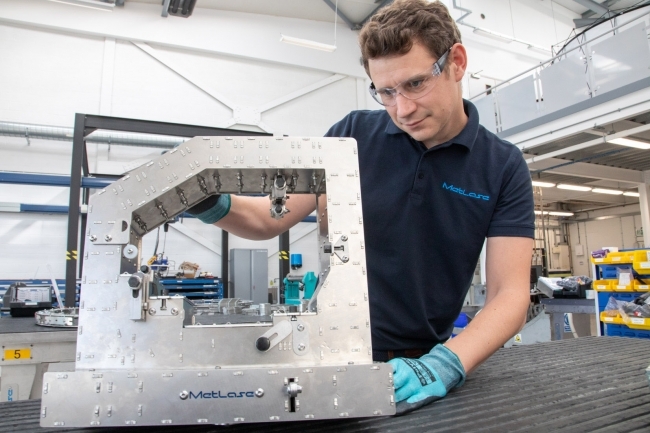 MetLase, which employs 25 people at its 12,500 sq ft state-of the-art facility at the AMP Technology Centre, is due to start delivering the first fixtures this week as part of a three-year contract.